LOCKHART, TX -- The pilot of a hot air balloon that crashed in Texas, killing all 16 people aboard, was convicted of drunken driving at least four times in Missouri and twice spent time in prison, court records show. A former girlfriend described Alfred "Skip" Nichols as a recovering alcoholic. She said the 49-year-old had been sober for at least four years and never piloted a balloon after drinking. Nichols also had a long history of customer complaints against his balloon tour companies in Missouri and Illinois dating back to 1997. Customers reported to the Better Business Bureau's St. Louis office that their rides would get cancelled at the last minute and their fees never refunded. 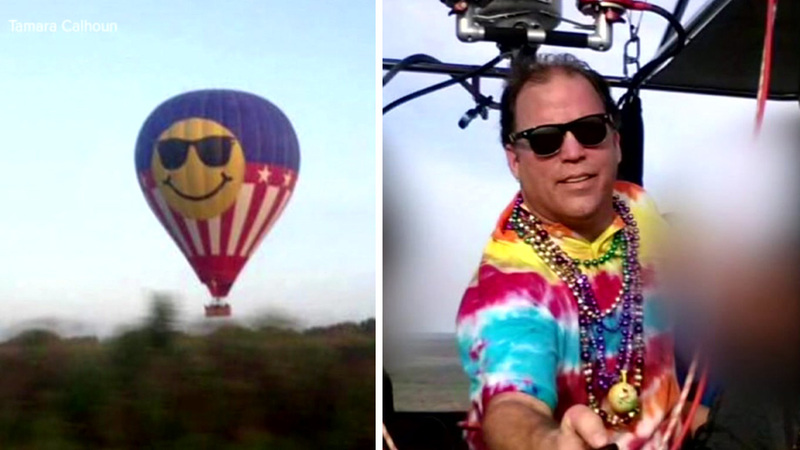 At least 16 people died in what is now the deadliest hot air balloon accident in U.S. history. Nichols pleaded guilty to driving while intoxicated in St. Louis County in 1990, then twice in 2002 and again in 2010, according to online court records. He was also convicted of a drug crime in 2000 and spent about a year-and-a-half in prison before being paroled. He was returned to prison in April 2010 after his parole was revoked because of his drunken driving conviction that year. He was paroled again in January 2012. Family members fear two College Station natives were on board the balloon that crashed outside of Austin on Saturday. Authorities have not publicly named anyone killed in Saturday's crash, saying it could take a while to identify the bodies. But Nichols was identified as the pilot by his friend and roommate Alan Lirette, who said Nichols was a good pilot. "That's the only thing I want to talk about, is that he's a great pilot," Lirette said, speaking to the AP from a house he shared with Nichols in Kyle, Texas. "There's going to be all kinds of reports out in the press, and I want a positive image there too." A local man described the pilot killed in a hot air balloon accident outside of Austin as a dedicated airman. The National Transportation Safety Board is investigating. Board member Robert Sumwalt said the pilot was licensed to fly the balloon. Between late 1998 and 2001, the Better Business Bureau said it had received more than three dozen complaints against Manchester Balloon Voyages, leading it to twice warn the public about the company. The St. Louis Post-Dispatch reported on the bureau's warning. When the newspaper asked Nichols to respond, he declined to comment. Bartch, who said she met Nichols in St. Louis in 1989, said Nichols' alcoholism and criminal record caused tensions with his father, Alfred G. Nichols III, a decorated retired lieutenant colonel who piloted medical evacuation helicopters in the Vietnam War. According to a February 2016 online obituary, the elder Nichols was awarded a Purple Heart among other medals and had commanded a helicopter rescue unit at Fort Carson in Colorado. Bartch said "there had been a mending" in Nichols' relationship with his father in recent years. The younger Nichols had attempted to join the military but could not meet the physical requirements, Bartch said. Bartch described Nichols as lighthearted, a follower of the Grateful Dead whose dogs, Zappa and Joplin, were named after two of his favorite musicians. She said that after she and Nichols broke up, they remained friends, and she helped him move to Texas in 2014. In order to keep his St. Louis business going, he started offering flights in Texas in the winter when St. Louis was rainy and cold. Federal Aviation Administration records indicate that the Texas company was involved in an accident with same balloon two years ago. On Aug. 3, 2014, the balloon made a hard landing in Kyle, Texas, when the pilot touched down abruptly to avoid striking a ground-crew vehicle that had been parked in the balloon's path. Two passengers were hurt. Missouri court records show that Nichols in 2013 settled a personal injury lawsuit filed by one of eight passengers in a balloon that crash-landed in suburban St. Louis. The lawsuit blamed lack of propane. Nichols blamed lack of wind. Although the baskets of many hot air balloons are limited to three to five people, some models used by sightseeing companies are much larger and can accommodate 20 people or more.